Every team needs a captain. And as we know, no team is a real team these days without a mascot. Yesterday we talked about the team in the Senate that thinks wearing milk and sugar on Wednesdays is just the swellest thing. The team needs a name. Team Urdu (You have to read yesterday’s blog to understand)? Team Seersucker? Team Cool (as it, “aren’t we cool because we’re wearing seersucker suits?) or Team Cool (because seersucker suits are supposed to wick away heat)? The ‘Suckers? The team captain is Eric Schmitt. He’s from Kirkwood. He went to Truman State University, where he was a two-sport athlete—but not in basketball, which you might think the tallest senator in state history (or so he says) might have been. No, he was a football and baseball player. We’ve been familiar with Truman University since it was Northeast Missouri State. We have never seen the school’s spring sports teams in seersucker uniforms. The Cardinals have Fredbird. The Phillies have the Phanatic. The whole thing started with the San Diego Chicken who is now just The Chicken. The senate has Kool Aid. That’s Matt “The Explosion” Michelson in full Dreamsicle mode. Yesterday one senator interrupted debate to ask if it was proper to be wearing orange prison pants in the senate. We were shocked when that particular senator, who comes from a family catering service background, didn’t know the difference between prison orange pants and sherbet pants. We thank the Senate photographer, Harrison Sweazea, who contributed some of the photographs in our Capitol Art book for the picture of the Captain and the Mascot of the Senate Seersucker Squad. A group photograph was rumored to be in the works yesterday. We’ll have to make an editorial decision about whether to post it. Journalisms ethics hold that one should not gratuitously expose one’s audience to scenes of disaster. 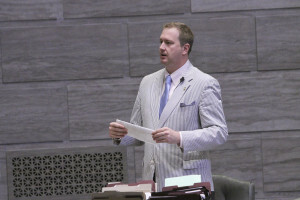 Check out the Seersucker’s worn by the Liason for Sen. Romine. Only Mr. Green can make it all look good.